µg = microgram, mg = milligram. Sweeteners: Sorbitol Solution & Maltitol Syrup, Purified Water, Gelling Agent: Gelatin (Halal Bovine Source), Vitamin Blend (Vitamin D3 [Cholecalciferol], Vitamin C [Ascorbic Acid], Niacin [as Nicotinamide], Biotin, Vitamin E [as DL-Alpha Tocopheryl Acetate], Pantothenic Acid [as Calcium Salt], Vitamin B6 [as Pyridoxine HCl], Riboflavin, Thiamin [as Mononitrate], Folic Acid [as Pteroylmonoglutamic Acid], Vitamin B12 [as Cyanocobalamin]), Flaxseed Oil, Acidity Regulator: Citric Acid, Strawberry Juice Concentrate (0.5%), Black Carrot Juice Concentrate, Natural Flavouring, Glazing Agent: Carnauba Wax. CHILDREN (4-12 YEARS): CHEW ONE TO TWO PASTILLES DAILY. Preferably take with a main meal. These chewable pastilles are not designed to be swallowed whole. Do not exceed the recommended intake. Do not give to children under 4. 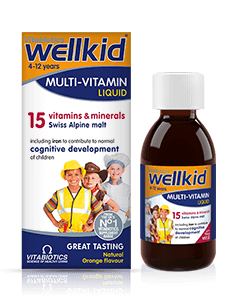 This comprehensive formula replaces other Wellkid multivitamins. There is no need to take another multivitamin. As with other food supplements, consult your doctor or pharmacist before giving to your child if they are under medical supervision, have epilepsy, suffer from food allergies, or are allergic to any of the ingredients. Made in a site that may handle nuts. Why is it that children may benefit from nutritional supplements? 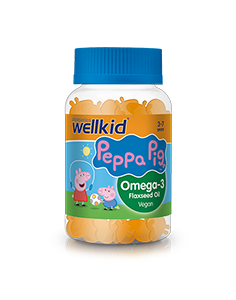 How many pastilles does one pack of Wellkid Soft Jelly contain? How and when should Wellkid Soft Jelly be taken? 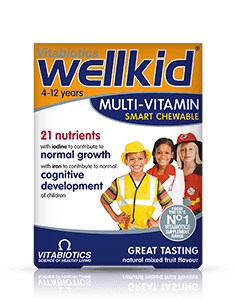 Are there any undesired effects whilst taking Wellkid Soft Jelly? 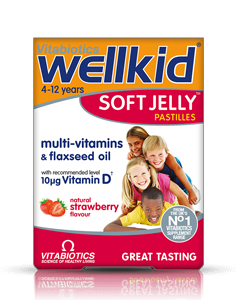 Is Wellkid Soft Jelly recommended with any other Vitabiotics products? Is Wellkid Soft Jelly suitable for vegetarians? Has Wellkid Soft Jelly been tested on animals? Government surveys have indicated that children's diets can sometimes be low in certain nutrients. Many children are not eating the recommended 5 portions of fruit and vegetables a day and so may not be getting all of the vital nutrients that their bodies need for long term health and development. Some foods may have a lower than expected nutritional content and may be low in certain micronutrients as a result of several factors including modern farming practices, the lengthy storage of 'fresh' food before it is sold in some shops and over cooking which can cause certain nutrients to breakdown. It is important to promote a healthy diet and lifestyle in children and to encourage positive eating and exercise habits for later in life. Food supplements are of course not a substitute for a healthy balanced diet! 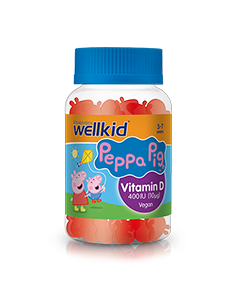 Wellkid Soft Jelly pastilles contains 30 chewy pastilles per pack, 1-2 pastilles a day are recommended. 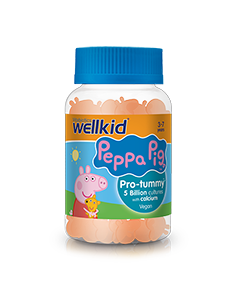 Chew 1-2 Wellkid Soft Jelly pastilles daily, preferably with a main meal. These chewy pastilles are not designed to be swallowed whole. 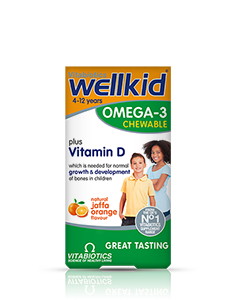 Wellkid Soft Jelly should not be given to children under the age of 4 years. It is important to ensure that your child does not take more than the recommended amount. Wellkid Soft Jelly has no known side-effects when taken as directed. Do not exceed the recommended daily intake. In case of overdose, seek medical advice immediately. As with all supplements, seek professional advice before using if your child is under medical supervision or suffers from any food allergies. Wellkid Soft Jelly contains sweeteners, which if taken in excess may have a laxative effect. Calcium is an essential mineral, needed for normal growth and development of bone in children. 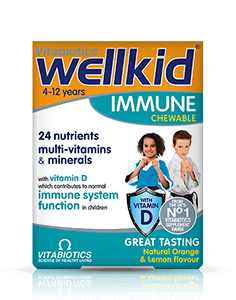 However, it has not been included in the Wellkid Soft Jelly formula, as it is not possible to include the right amount in one pastille. 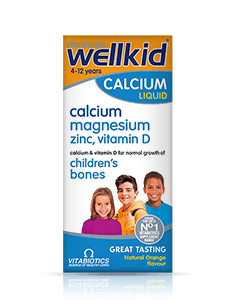 Rather than including just a token amount of calcium, Wellkid Soft Jelly has been designed so that it can be taken alongside Wellkid Calcium Liquid, which contains calcium and vitamin D that help maintain the normal growth and development of bone in children. No. Wellkid Soft Jelly contains gelatine so is not suitable for vegetarians. No. 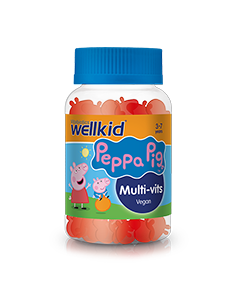 Like all other products in the Vitabiotics range, Wellkid Soft Jelly has not been tested on animals.